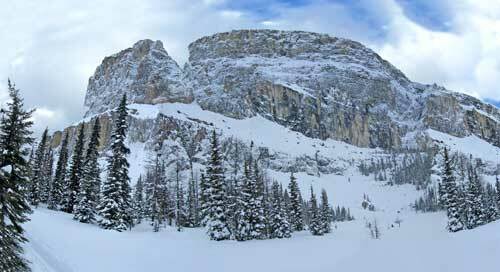 I’ve mentioned snowshoeing before in this blog, can’t get enough of it this winter. It’s a fantastic low impact way to get a great workout and learn some backcountry skills. This image is a view of the back of Castle Mountain standing on the glacial Tower Lake. To get a view like this, you have to hike in deep snow for 4.5 hours, up the south face of Castle Mountain. It’s only 2.5 hours to get back down. It’s so quiet up there, all you can hear is your own breath.